US State Department’s Voice of America boldly proclaimed “Egyptian Media: Military Shakeup ‘Revolutionary’,” airing proclamations from the Egyptian Muslim Brotherhood that, “Egyptians have been “dreaming of a fair democratic system for more than 60 years.” It is unlikely that Egyptians have been “dreaming” of an end to their secular system of governance, or “dreaming” of a sectarian extremist political party coming to power, notorious for thuggery, violence, and for being a stalwart pillar of Western machinations. Morsi’s assault on Egypt’s press has coincided with “mysterious” sectarian extremist attacks on Egyptian security forces on the Sinai Peninsula, most likely the collective work of Israel and Hamas. Of course, Hamas, an affiliate of the Muslim Brotherhood, is a direct creation of Israel (and here), and like the Muslim Brotherhood, is a pillar of US-Israeli machinations throughout the region. Morsi quickly used the convenient attacks as a pretense to sack various security officials, the momentum of which carried forward to the forced “retirement” of Egypt’s military leadership. Raise questions about the Muslim Brotherhood’s “democratic credentials” indeed. The Muslim Brotherhood is a theocratic sectarian extremist movement, and not only that, but a regional movement that transcends national borders. It is guilty of decades of violent discord not only in Egypt, but across the Arab World and it has remained a serious threat to secular systems from Algeria to Syria and back again. Today, the Western press has decried Egyptian and Syrian efforts to hem in these sectarian extremists, particularly in Syria where the government was accused of having “massacring” armed Brotherhood militants in Hama in 1982. The constitutions of secular Arab nations across Northern Africa and the Middle East, including the newly rewritten Syrian Constitution, have attempted to exclude sectarian political parties, especially those with “regional” affiliations to prevent the Muslim Brotherhood and Al Qaeda affiliated political movements from ever coming into power. And while sectarian extremists taking power in Egypt and attempting to take power in Syria may seem like an imminent threat to Western (including Israeli) interests – it in reality is a tremendous boon. Morsi himself is by no means an “extremists” or an “Islamist.” He is a US-educated technocrat who merely poses as “hardline” in order to cultivate the fanatical support of the Brotherhood’s rank and file. Several of Morsi’s children are even US citizens. 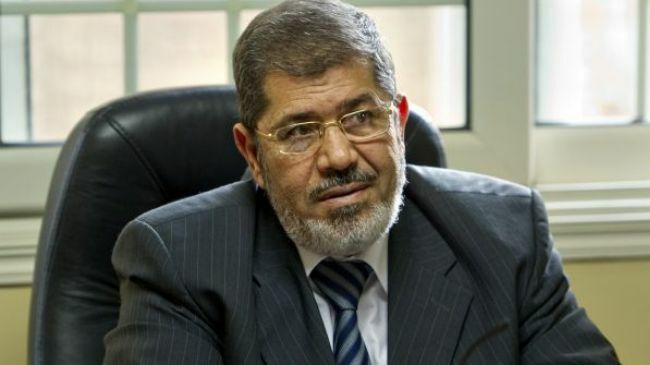 Morsi will gladly play the part of a sneering “anti-American,” “anti-Zionist” “Islamist,” but in the end, no matter how far the act goes, he will fulfill the West’s agenda. Already, despite a long campaign of feigned anti-American, anti-Israel propaganda during the Egyptian presidential run-up, the Muslim Brotherhood has joined US, European, and Israeli calls for “international” intervention in Syria. Alongside the CIA, Mossad, and the Gulf State despots of Saudi Arabia and Qatar, the Muslim Brotherhood’s Syrian affiliates have been funneling weapons, cash, and foreign fighters into Syria to fight Wall Street, London, Riyadh, Doha, and Tel Aviv’s proxy war. It is hardly a speculative theory then, that the uprisings were part of an immense geopolitical campaign conceived in the West and carried out through its proxies with the assistance of disingenuous organizations including NED, NDI, IRI, and Freedom House and the stable of NGOs they maintain throughout the world. Preparations for the “Arab Spring” began not as unrest had already begun, but years before the first “fist” was raised, and within seminar rooms in D.C. and New York, US-funded training facilities in Serbia, and camps held in neighboring countries, not within the Arab World itself. In 2008, Egyptian activists from the now infamous April 6 movement were in New York City for the inaugural Alliance of Youth Movements (AYM) summit, also known as Movements.org. There, they received training, networking opportunities, and support from AYM’s various corporate and US governmental sponsors, including the US State Department itself. The AYM 2008 summit report (page 3 of .pdf) states that the Under Secretary of State for Public Diplomacy and Public Affairs, James Glassman attended, as did Jared Cohen who sits on the policy planning staff of the Office of the Secretary of State. 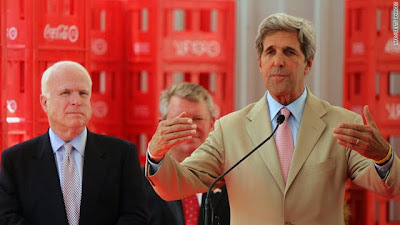 Six other State Department staff members and advisers would also attend the summit along with an immense list of corporate, media, and institutional representatives. Image: The Serbian Otpor fist… in Egypt? The same US organizations that trained & funded Serbians to overthrow their government in 2000, were behind the April 6 Movement and the Egyptian “Arab Spring.” Sun Tzu in the Art of War said, “all warfare is deception.” In fourth generation warfare, no deceit is greater than convincing people they are “liberating” themselves when in reality they are dividing and destroying their nation so that Wall Street & London’s network of already in-place NGOs can take over. This, while a suitable proxy is put in office as PM or president. In Egypt, these NGOs would already have a new constitution drafted and ready before the fall of Hosni Mubarak. Photo: From left to right, ICG members Shlomo Ben-Ami, Stanley Fischer, Shimon Peres, and Mohamed ElBaradei. Despite claims that Mohomed ElBaradei is “anti-Israeli” or “anti-West,” it is a documented fact that he is indeed an agent of the Wall Street-London corporate-fascist global oligarchy, and a member of the International Crisis Group which includes several current and former senior Israeli officials. The same charade is now taking place with Morsi of the Muslim Brotherhood. That ripple effect of course, was the “Arab Spring” and the subsequent destabilization, violence, and even US armed and backed warfare that followed. While nations like Libya and Tunisia are now run by a BP, Shell, and Total-funded Petroleum Institute chairman and a US NED-funded “activist” respectively, Egypt had managed to ward off and expose the US’ first proxy of choice, Mohammed ElBaradei, who’s own movement was forced to denounce him as a Western agent. Photo: Mamdouh Hamza collaborated with Mohamed ElBaradei in executing the premeditated, US-engineered destabilization of Egypt in January 2011. Most likely to remove ElBaradei’s terminally infected public image, he has finally outed ElBaradei as a member of George Soros’ International Crisis Group and accused him of having “strong ties to Zionism.” Hamza himself, however, is just as compromised as ElBaradei, perhaps more so. The Egyptian military would then strike at seditious Western-funded NGOs, seeking to undermine the source of destabilization, the conduit through which US money and support was being funneled through to “activists,” and expose the true foreign-funded nature of the political division that has gripped the nation for now over a year. A February 2012 AP article reported that Egypt’s generals declared, “we face conspiracies hatched against the homeland, whose goal is to undermine the institutions of the Egyptian state and whose aim is to topple the state itself so that chaos reigns and destruction spreads.” Clearly, this was an accurate observation, not a political ploy to undermine “opposition” activists, with similar US-hatched conspiracies documented and exposed from Tunisia all the way to Thailand. With the more “blunt” instrument of Morsi and the Muslim Brotherhood taking the reins in the wake of ElBaradei’s fall, the West will inevitably face a reckoning in the distant future after the Muslim Brotherhood has served its purpose. Until then, it seems to be doing a masterful job disassembling the institutions, checks, and balances of Egypt’s secular government. Egypt’s “revolution” has gone from a quasi-pliable proxy dictatorship, to one both more hardline and brutal domestically, and more pliable and willing in terms of serving Western interests abroad. For the average Egyptian, a dark age has begun to descend – one where freedom of speech is still curbed, the press still muzzled, an autocratic despot still holding the reins of power, but also one where the largest military in the Arab World is commanded by hardline theocratic sectarian extremists with regional ambitions and affiliations along with a proven track record of shedding blood within and beyond its own borders. McCain (left) and Kerry (right) gesticulate as they explain Wall Street and London’s agenda within the confines of an Egyptian Coca-Cola factory. This was part of a trip surveying the effects of their US-funded opposition overthrowing Hosni Mubarak’s government. While war and destruction seem approaching over the immediate horizon, the final goal is global corporate-financier hegemony being extended over Egypt and its neighbors. Morsi will inevitably, but quietly prepare the grounds for the machinations described by McCain and Kerry in 2011. With the NATO-created terrorist safe-haven of Libya to Egypt’s west, and the epicenter of Arab World despotism, Saudi Arabia to its east, a corporate-financier underwritten terrorist empire is rising from the barren north of Mali, to the oil rich shores of Saudi Arabia, Qatar, and the United Arab Emirates.